Texan singer-songwriter-multi-instrumentalist Aaron Burton’s seventh album, Southern Swagger, continues in the same impressive vein as his most recent release, All Night Long (favorably reviewed in the 09 April 2015 issue of Blues Blast Magazine). The new album contains 10 self-written songs, with Burton on vocals, guitar and banjo, William “Stompin’ Bill” Johnson on harp, Dirk Cordes on drums and Joe Degelia on steel guitar. Sonnie Collie also adds bass to one track and guitar to another. 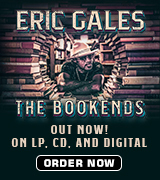 The musicians have played together for years and their ability and willingness to focus on the song has resulted in a highly enjoyable album of roots-influenced acoustic country blues. Cordes in particular sets up a series of irresistible rhythms while never over-playing or over-shadowing the song and the space that is left paradoxically creates a bigger sound. But there is also a palpable joy apparent throughout the album, as if the musicians had a total blast while recording it. Opening with the gloriously-titled “My Name Is Aaron Burton” Burton explains the origins of his old pseudonym, Peetie Whitestraw, over an upbeat country folk blues groove. There is a sly wit to Burton’s songs, which he sings in a lazy but engaging drawl, but there is no lack of emotional depth in his voice – the haunting “Heroine And Cocaine” has echoes of the desperation and desolation of the great Skip James. 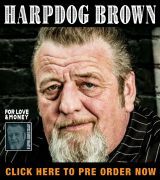 Lyrically, he covers traditional blues themes such as death (as in the ominous one-chord boogie of “Murder”) or basic carnal desires (in the rollicking “Real Good Booty” or the country blues of “Copulate”, in which he winningly admits “I want to copulate, copulate with you. I can’t concentrate, it’s all I wanna do. Look here mama, I’m telling you straight, all I want to do is copulate. I want to copulate with you”). He is also adept at finding what humour can be eked out from a desperate situation, as with his promises to his baby in “Jewelry Store”. Burton adds bouncing banjo to “Caddo Line” but primarily lays down rhythm guitar on his acoustic. Burton, Johnston and Degelia all take solos at various times, but the primary focus of the album is on the songs with the lead instruments weaving in and out of the vocal melodies. One of the highlights of the album however is the closing instrumental, the album’s title track: wonderfully dreamy (but uncredited) sax playing and articulate finger-picking over the top of another top notch Cordes groove. 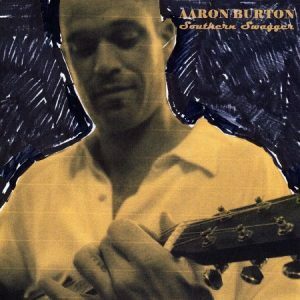 Southern Swagger is yet another top class slice of acoustic country blues from Aaron Burton. There is an enticing timelessness to his music. Highly recommended.